I see this all the time. Some person thinks their car is more precious than others and takes up two spots to ensure no one gets anywhere near it. 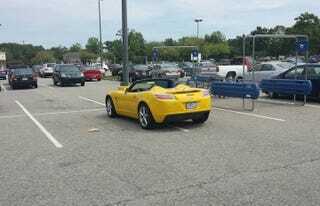 My friends tell me it’s ok if you park at the far end of the parking lot where it’s empty, but for the most part these asshats do it close to the store where they’re shopping. Some people wedge their car into the mini spot next to the person preventing them from opening their doors, but sometimes that results in a major backlash...like with a baseball bat. Other times they simply light the car on fire. If the offense happens in Russia. Last week I came across a better way to handle these asshat parkers. It’s a little note to leave on their windshield that is far more amusing. Especially if you see the person when they read it. I hear they go nuts. I also included a high res copy on Build Race Party so you can download it, make copies, and use it yourself. You can download it here.